First of all, thanks to everyone who joined us for the November Meeting! We had a great time getting together. Sorry for the late post, holidays were too much fun and time got away from me. Show & Tell: To be honest, this is my favorite portion of every meeting! I remember meeting with the new Board Members last summer and repeadetly exclaiming that we have to have Show & Tell on every agenda! I get a bit excited…sorry. There were some lovely items shared at the meeting. 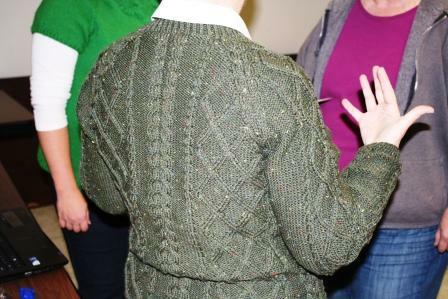 Karen came in sporting a sweater so fine that we made her swear she actually knit it…in pieces…and seamed it herself. It really looked store-purchased! The Umaro Blanket is growing. Also, a lovely example of reversible cables that were dropped-down and fixed! You seriously can’t tell! Now that’s some courage. Several lovely pairs of mittens made it to Show & Tell this month! Several more were in progress. 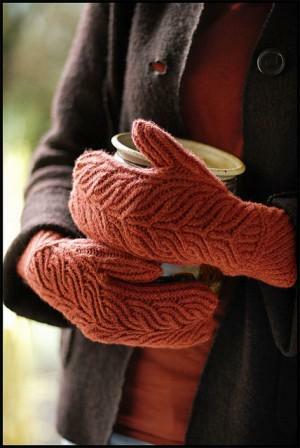 It is great seeing how different these mittens look in the various yarns and colors! I’m almost done with my first one (I had to put it on hold to complete a time-sensitive project. ), but I can’t wait to pick them back up. Once you get going on the hand portion on the mitten, you get in a zone and they go fairly quickly! I’ve been trying to think of how we can improve our KAL’s. We never met outside of our meetings to work on them, so I hope we can add that element in several of the towns. 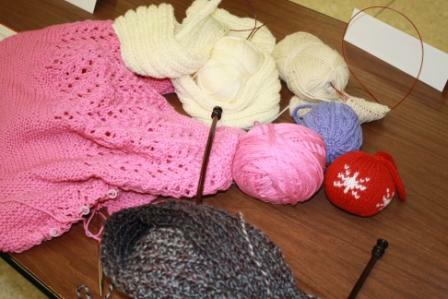 Maybe some of the local knitting groups might be willing to help host the KAL for there area. 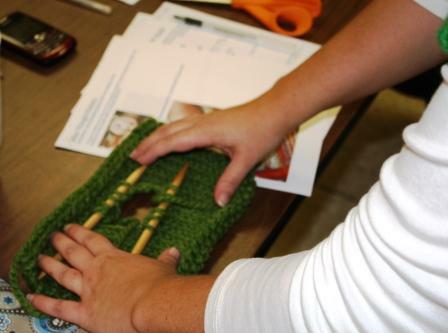 All of the KAL’s are open to members & non-members because we LOVE knitting with people! Let us know if you have a local group that is interested! If you haven’t finished your mittens (there are several of us), don’t forget the Ravelry thread where people can post their progress and questions. It’s not too late!! 2012 is already looking like it’s going to be an exciting year! I can’t really spill all of the detials yet, but we are planning an awesome trip for the summer along with smaller events, knit-a-longs, possbily a read-a-long and more! Also, in 2012 we decided that we just can’t wait for the next Hop, so we are planning to highlight one of the 12 LYS’s each month. We will start a carpooling list and let you know all of the details. There are so many unique shops! We will be announcing the January location at the December meeting and I will be sure to post it. Jalaa Miller (Yes, she’s a married woman now!) gave us a brief tour of the TKGA website. When you join CKKG, your annual membership automatically includes your national membership as well. After your membership form is processed you will receive an email (or a letter if you didn’t provide an email) with a code for logging into their website. The code is buried in a paragraph of writing, so you will have to look for it. It will tell you how to log in. Once you are logged in, I suggest you change your password to something more familiar. There are free patterns, articles, newsletters and more to enjoy…and don’t forget about the Cast On magazine that will be delivered to your door quarterly! Let us know if you have ANY troubles!! 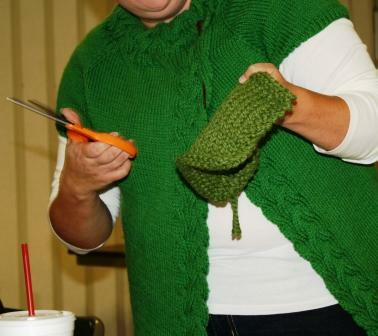 Kim Neufeld led us through Elizabeth Zimmerman’s timeless classic technique of adding pockets to any project. There are several advantages to using this technique. I prefer to add pockets as the last step in finishing a sweater. It helps to be able to try on the sweater and mark exactly where you want the pockets to end up. Also, I just love cutting my knitting and any excuse to pull out the scissors works for me! Kim loves ANY excuse to cut her knitting! 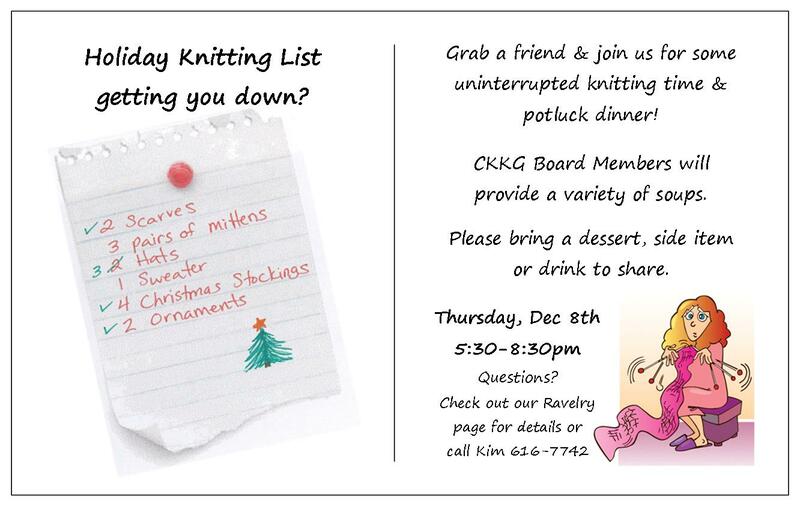 All knitters are invited to join us in December for food, fun and uninterupted holiday knitting time! CKKG Board Members will be bringing several types of soup and other are invited to bring their favorite snack, side dish, bread or drink to share. You do not need to be a member, but don’t forget your Show & Tell projects! Anyways, thanks to everyone for helping make a great meeting. Stay tuned…clearly there is A LOT more to come! See you next month, Thursday December 8th from 6-8pm – Harvey County Courthouse (Newton). Previous Previous post: November Guild Meeting! Next Next post: December Potluck!